The sports theme bouncer features baseball, soccer, football, and basketball This bouncer has a basketball hoop inside and a 15x15 bouncing area for lots of fun. 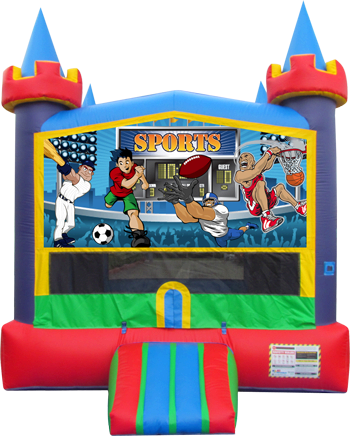 The sports theme bouncer is a great way to make your next party or event super fun for all. It has many vibrant colors with big viewng windows on all sides. The sports theme commercial bouncer was made in the USA.